The storms that ravaged the southern United States this past week not only produced deadly severe weather, but also incredible flooding. 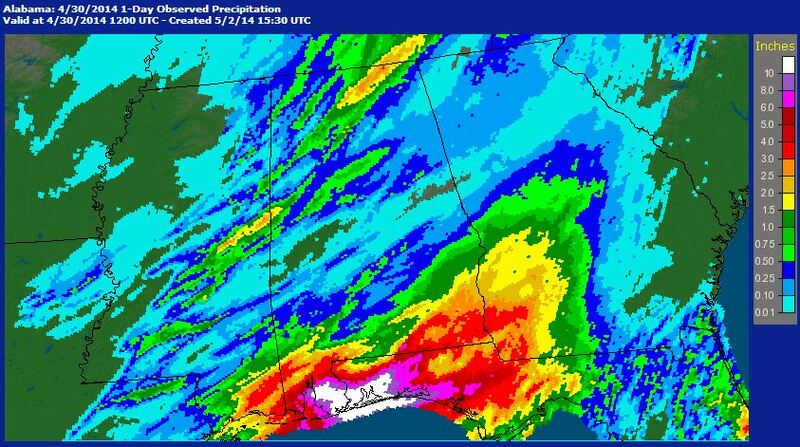 Figure 1 shows parts of the Florida Panhandle and southern Alabama received in excess of 10 inches of rain on Tuesday, April 29 alone! A previous blog post introduced the Overshooting Top Detection product and explained its utility in severe weather situations. Overshooting tops are also indicators of where heavy rainfall may be occurring. Furthermore, the constant presence of overshooting tops over a particular location over an extended period of time may indicate a prolonged period of heavy rainfall, which could lead to flooding. The animation in Figure 2 shows GOES-East IR imagery with overshooting top detection’s overlaid from the afternoon of the April 29 into the early morning hours of the April 30. During much of this period, GOES-East was in Rapid Scan Mode, meaning images were often available every 5-10 minutes (instead of 15). Notice the persistence of overshooting tops centered over the Mobile area throughout the period, where copious amounts of rainfall were recorded. By about 09Z, a downward trend in overshooting top detection’s had begun as the storm system shifted eastward and weakened. The Overshooting Top Detection product provides a day/night capability for forecasters to easily identify where within a convective system the strongest updrafts are occurring, and where severe weather and/or heavy rainfall may be occurring given other meteorological factors. Figure 2: April 29 22Z – April 30 10Z GOES-East IR with Overshooting Top Magnitude overlaid. 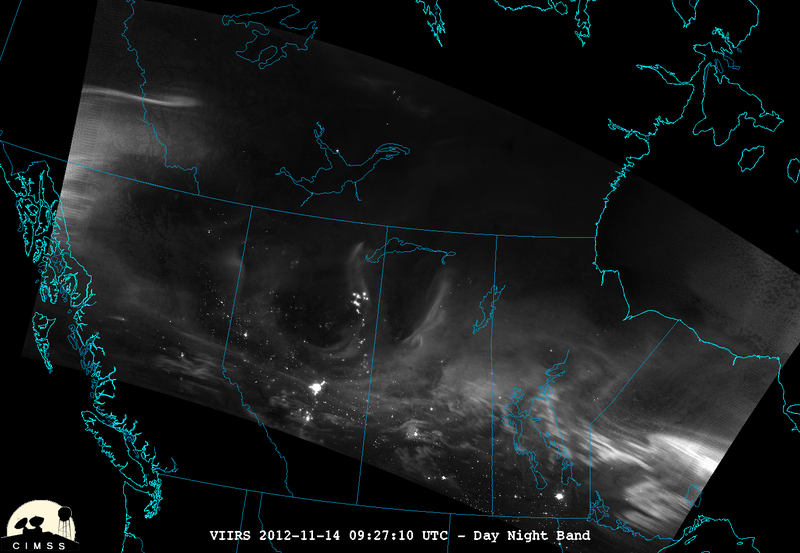 Figure 3 shows this same system during the early morning hours of April 30 at much higher resolution. 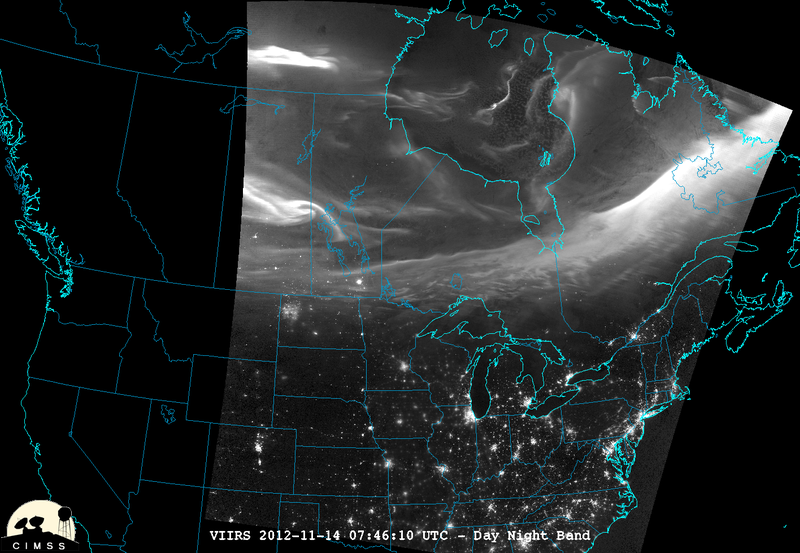 This is a 375 m IR image taken with the Suomi NPP VIIRS instrument. Notice the visibility of features that aren’t easily seen in current GOES IR imagery such as gravity waves and overshooting tops. The spatial resolution of infrared (IR) polar imagery (e.g., Suomi NPP VIIRS and MODIS) is currently superior to similar geostationary data over North America (~1km vs 4km). Unfortunately, there are relatively few polar passes a day over the contiguous United States. 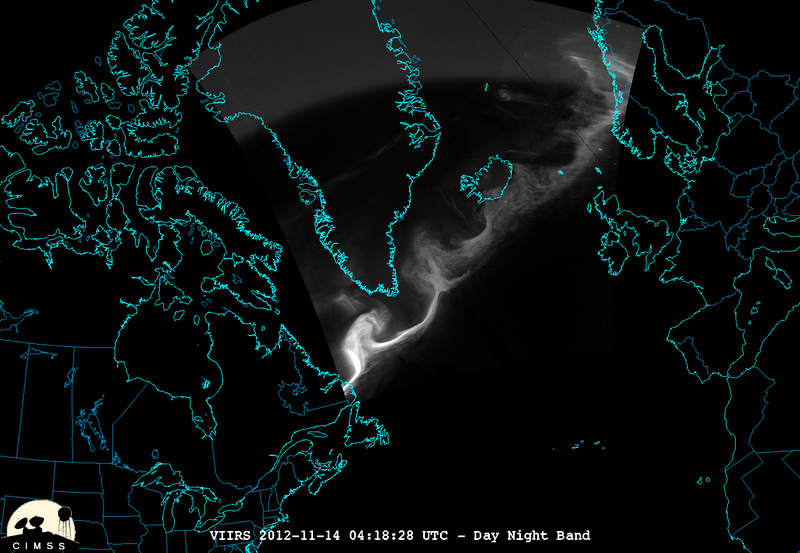 At best, there would be 2 passes over any one location every 12 hours for each polar satellite. This is one reason why it is challenging to introduce operational forecasters to the advantages in using this imagery. This will all change over the next year with the National Weather Service’s (NWS) second generation Advanced Weather Interactive Processing System (AWIPS2), and the use of polar imagery will become more and more common within NWS Forecast Offices. This is because AWIPS2 will allow the forecaster to overlay multiple images to create GOES/POES hybrid satellite loops. 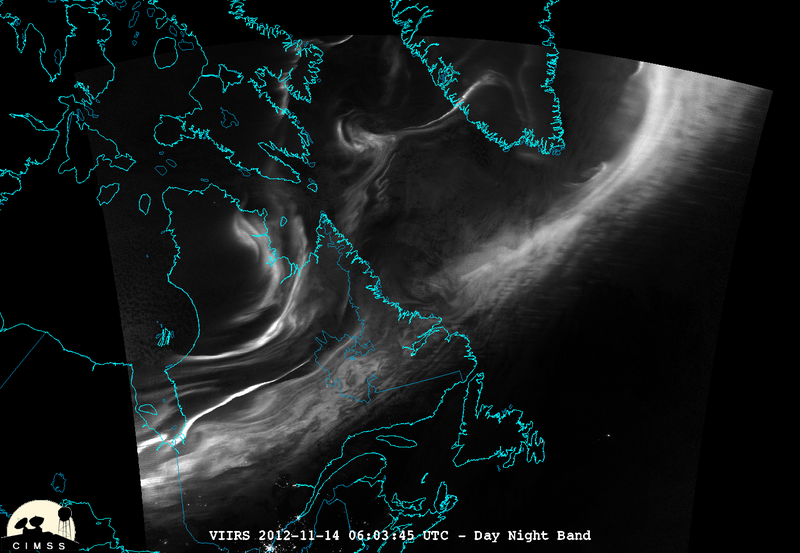 In the image below, this capability is shown using IR imagery from GOES-13 (10.7 μm), MODIS (~11.0 μm), and Suomi NPP VIIRS (11.45 μm) between 0615 and 0801 UTC on 28 March 2014 over the Southern Mississippi Valley. IR imagery from GOES-13 (10.7 μm), MODIS (~11.0 μm), and Suomi NPP VIIRS (11.45 μm) between 0615 and 0801 UTC on 28 March 2014 (click image to enlarge). When polar imagery is available from MODIS or VIIRS, it is overlaid on the GOES imagery which allows the forecaster to take advantage of the greater spatial resolution of the polar imagery. In the example shown above, there are GOES-13 images at 0615, 0631, and 0645 UTC, followed by a VIIRS image at 0655 UTC, two more GOES-13 images at 0715 and 0731 UTC, a MODIS image at 0740 UTC, and one more GOES-13 image at 0801 UTC. As the forecaster cycles through the images, you can envision how this capability would be beneficial. The increased spatial resolution from MODIS and VIIRS allows important details to be extracted which include the location and strength of updrafts/overshooting tops and the location where new convection is forming on the southwestern flank of the MCS. In addition, when deep convection is present, the parallax (GOES pixels are displaced slightly poleward from their correct position) that occurs with geostationary satellites is magnified and the polar imagery “corrects” the location for the forecaster. To see the full impact of these hybrid images, click on the image for a full resolution version.